Discover competitors in paid and organic searches. Know more about site's ads: texts, keywords, costs, positions. Learn about top traffic and top paying keywords for the site. Analyse keyword profitability. Find related keywords to expand your research area. Get essential information about sites competing in paid and organic searches. Ad texts the site uses to advertise in AdWords. Use Export option to get the full report (with additional data) in one table. List of search queries the site advertises in AdWords. Point your mouse at any keyword to view more data. Use Export option to get the full report in one table. Ad position – Position of ad in Adwords block on Google results page. List of search queries for which the site has positions in Google organic search results. You can sort the list by position, traffic or traffic cost. Point your mouse to a keyword to view more data. Use Export option to get the full report in one table. List of subdomains for given domain name. Click corresponding domain link to get the full report. Other domains on IP ""
List of domains hosted on the same IP as given domain name. Click corresponding domain link to get the full report. Start using SERPAnalytics right now! Enter domain name in the search form and click GO. Access our database of 20M sites, 1 Billion search engine positions, 150M adwords ads and 10M keywords. Reveal positions the site has in Google. Know most profitable keywords and keywords leading the most visitors to the site. 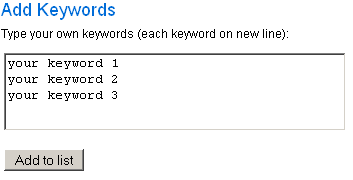 Discover keywords the site advertises in AdWords. Find out ad poition, url, keyword avg. cpc, and more useful information. View ad texts the site uses in AdWords. Export and analyse data to know everyting about AdWords strategies. Enter keyword in the search form and click GO. Find related keywords to expand your marketing research area and widen your ad coverage. Know popularity and profitability of the keyword. Reveal domains advertising on any given keyword in Adwords. Get full list of domains having positions on given keywords in Google organic search results. No positions - either positions were not found or this site hasn't been processed yet. In general, position report is available the next day you added the site and/or keywords. Groups are useful when you want to monitor several sites for the same bunch of keywords. First of all, it is convenient: you add keywords only once, not for every site in the group. Second, it is more efficient: you can monitor more keywords, as total number of keywords is counted for groups, not for every site in the groups. Sorry, not enough data to show statistics graph. You have no sites. Use a form below to add some! Please, pay attention that www.domain.com and domain.com are treated as different domains. You have no sites. Use the form below to add some! You haven't added any sites yet. Use a form below to add some! Notice. To track non-www version of domain along with www you need to add non www domain. E.g. if you want to monitor www.yourdomain.com and domain.com add domain.com only. You did not enter any keywords yet. Use a form below to add some! This tool helps you to choose keywords for domains that you have added to your monitoring list. Select one of the domains and you will see a list of most important keywords concerned with this domain. These are top cost equivalent keywords. You will see the following information for each keyword: domain position in Google, estimated monthly traffic from this position and cost equivalent value (estimated cost of traffic if bought in adwords). Click on keyword to get full information about it. Click 'Add' to put the keyword into 'Add Keywords' area. Click domain link below to know more about the domain and its organic and paid keywords. Three simple steps to start using a powerful Tool! First month is free. You can test all SERPAnalytics features during first month. 4. After 24 hours you can see site Search Engine Rankings for keywords. Click Tracking Results. 5. Add new sites, or competitors to this group. Create more groups. Note, we only charge for keywords, not for sites. Now you can see Tracking results for all sites in the group. You will also receive tracking results by email. Create more groups and use our additional tools. SERPAnalytics is a flexible yet easy to use Position Monitoring Tool. this tool enables you to view full SERP dynamics for given keywords. Monitor not only certain domains but the whole SERP! Your plan allows to monitor full SERP keywords. Your account type is __account_type__. You can't edit list of SERP tracking keywords. Predefined keywords can show you the full power of this tool. To add your own keywords, please upgrade your account. You have no keywords yet. Use a form below to add some! * Free tracking - SERP tracking is provided for free for this keyword. You can find this keyword in public SERP archives. Enter your query in the search form and click GO. Analyse SEO & SEM techniques using a comprehensive set of tools and useful features. 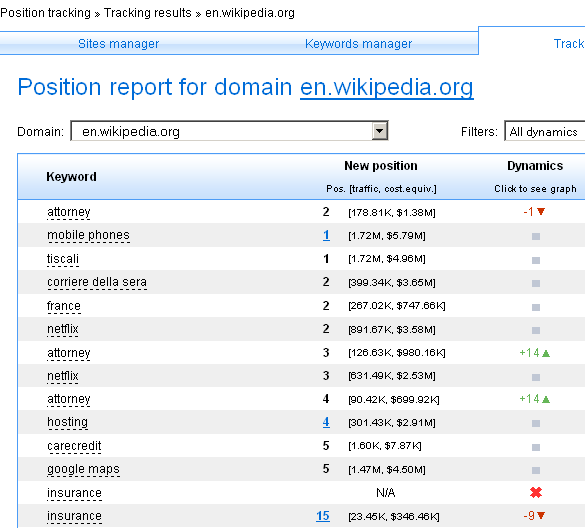 Find out position dynamics for each site in the SERP. Get values of numerous SEO & SEM parameters all at once. View archived SERPs to see position changes in detail. Daily, weekly, monthly archives. You may order any Custom Report or Tracking Plan with SERPAnalytics. Simply contact us to discuss the details. We accept Visa, MasterCard, Amex, Discover, Diners Club, JCB, Solo, Maestro, Wire Transfer, Money order, etc. Your account type is __account_type__. To switch to __new_account_type__ Account you must change your contract from __account_type__ to __new_account_type__ on Plimus*. *Login to your Plimus account, select SERPAnalytics __account_type__ Subscription and click Change Plan. Select __new_account_type__ Subscription and click "Subscribe for this plan". If you have any problems with managing your Plimus account, please contact us. Notice! You are going to switch from a more expensive account to a cheaper one. The difference in cost won't be refunded! Powered by Plimus, a leader in online payment processing. Your account type is __account_type__. Additional tracking package is available only to SEO and SEO+SEM users. Please, upgrade your account. You are using free SEO trial account. Additional tracking package is available only to paid SEO and SEO+SEM users. Please, upgrade your account. You have selected Additional tracking package subscription. Your account type is . To switch to Starter Account you must change your contract from to Starter on Plimus*. *Login to your Plimus account, select SERPAnalytics Subscription and click Change Plan. Select Starter Subscription and click "Subscribe for this plan". Your account type is . To switch to Basic Account you must change your contract from to Basic on Plimus*. *Login to your Plimus account, select SERPAnalytics Subscription and click Change Plan. Select Basic Subscription and click "Subscribe for this plan". Your account type is . To switch to Advanced Account you must change your contract from to Advanced on Plimus*. *Login to your Plimus account, select SERPAnalytics Subscription and click Change Plan. Select Advanced Subscription and click "Subscribe for this plan". Advanced is your current account type. Your account type is . To switch to Pro Account you must change your contract from to Pro on Plimus*. *Login to your Plimus account, select SERPAnalytics Subscription and click Change Plan. Select Pro Subscription and click "Subscribe for this plan". Pro is your current account type. Adwords data package is already enabled for your account. If you want to switch it off then login to your Plimus account and change the "Active" state of the Adwords data package. You have selected Adwords data package subscription. SERPAnalytics is an online Position Tracking Service designed for SEO & SEM specialists. SERPAnalytics provides variety of SEO tools along with access to millions of records of essential data including search engine positions archive and competitors data. Competitor research: spy on your competitors! Spy Tool comes with all of our tracking plans. Track sites positions in Google, Yahoo! & Bing. View position dynamics graphs. Use suggestion tool to track most profitable keywords for the site.